2.5 stars, almost a 3. Going into Torment, I was hesitant at what was waiting for me. Fallen (book 1) was pretty bad, with the only redeemable quality being the last few chapters.Book 2 of the Fallen series was an improvement over book 1. 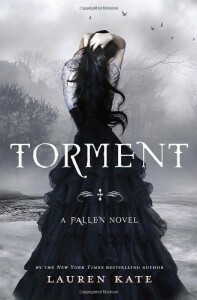 Where Fallen was long and trying, Torment had more to keep me interested. Ms. Kate stepped up her game this time, drawing me into a story that flowed and moved quickly, with much more action and mystery. Miles the character was an interesting addition to the story, but I missed seeing Cam as much in this installment. Hopefully he will get more focus in book 3.I still can't stand Luce. She was even worse in this book. But...I wasn't as bored reading this book as I was with the first one.